Emma Carroll is fast establishing herself as one of the most consistent and accessible authors writing for KS2 readers. Taking historical backgrounds she makes them immediate and appealing. Her books have varied and intriguing themes ranging from a ghost story, her first Frost Hollow Hall to the excavation of Tutankhamen, a circus to WWII. Here we are back with that World War II, a setting which featured in Letters from a Lighthouse. Indeed young fans will be delighted to meet characters they can recognise. 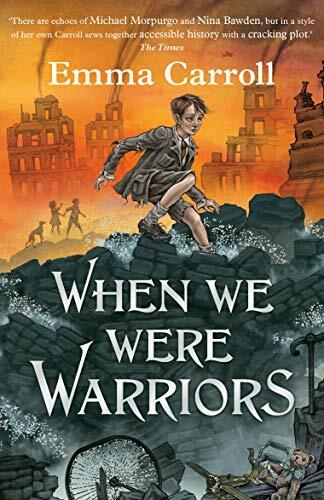 However, When We Were Warriors is not a single novel. Rather it is a linked series of three novellas. There are three protagonists to enjoy, three situations in which to become involved – but Carroll skilfully links all three in a way which provides a satisfying read. This is not just through the setting – the south-west coast of England facing the potential threat of invasion and enduring bombing raids., but also through characters, not least, Eddie the GI stationed in the area; a clever device. The situations are domestic, requiring believable involvement and action on the part of the young people. Carroll’s writing style is easy and contemporary without being anachronistic, attitudes are faithfully represented and there are many details that will both surprise and inform. Though many young readers will easily finish this book perhaps in one sitting, for others the organisation into three separate stories will provide an added attraction.